Dr. 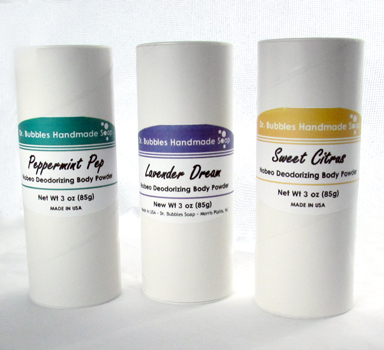 Bubbles Nobeo truly natural deodorant products completely neutralize body odor. They don't try to cover up body odor. They kill the bacteria that causes your B.O. Not just for pits, you can use both products on your feet. Even better, neither of our products will ruin your clothes. Our special blends of all natural ingredients neutralize B.O. while killing both bacteria and viruses from your skin. These aren't secret ingredients and their scientific, evidence based effectiveness comes from real research not heresay. No more excuses! Our product testers are unanimous in their ratings; once you use our Nobeo Deodorizing Body Powder your B.O. is history. Some of our product testers went as long as 5 days without bathing. As one male tester put it, "I decided to push the envelope and see if the claims were true. Even at 5 days I had zero B.O. I just finally wanted a shower." Even when you perspire and use our Nobeo Deodorizing Body Powder daily, you'll have no B.O - - zip, zilch, nada. We can't stop you from sweating (you'll die) and we don't claim that these are antiperspirants. We do, however, totally stop the funk. 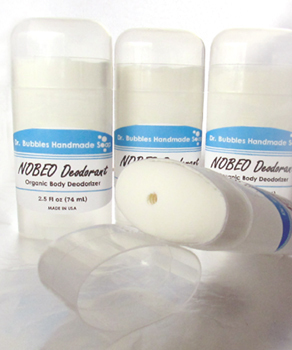 Nobeo Body Deodorizers are guaranteed to end your B.O., period. Nobeo is a registered trademark of Dr. Bubbles Handmade Soap.